Switching is quick and easy, in fact it only takes 3 steps and it can all be done from your mobile device. Register for an agent account: this will only take a few seconds since all we need to get started is your name and contact information (email and phone). Optionally, you can tell us the number of accounts your package requires to start and what kind of website skin you want your players to use. Lastly, we'll need the name of your current pay per head service. Once you get the confirmation from your registration, give us a call, or if you prefer we can call you to find the details of what you need. This initial contact is crucial to get your up and running as fast as possible. The reason we prefer to do this via phone is, first, to establish a good rapport, second to understand all the rules, limits, wager types, player profiles, line types etc. that you require for your package. With our state of the art software, we are able to configure nearly every aspect imaginable, but in order to do it right we need to understand your book and desires. Not a phone person? Click the LIVE CHAT tab floating on this page and we can do it all from there. We create your package for you, after we know and understand all the intricate details of your business, we can proceed to create the necessary accounts, profiles, line types etc. This is no small task, especially if your players have open wagers and balances with your previous provider, but our excpetional staff is so familiar with moving people to ace from all of our competitors websites that the average move time is just 15 minutes. And Voi là, you are ready to go! If you would like to create a brand of your own, we can custom build a website for you that will have your preferred color scheme, logo and phone number. We have some of the best graphic designers on our staff who can build you a beautiful website in no time, we can even customize the betting backend to match your website’s color scheme. 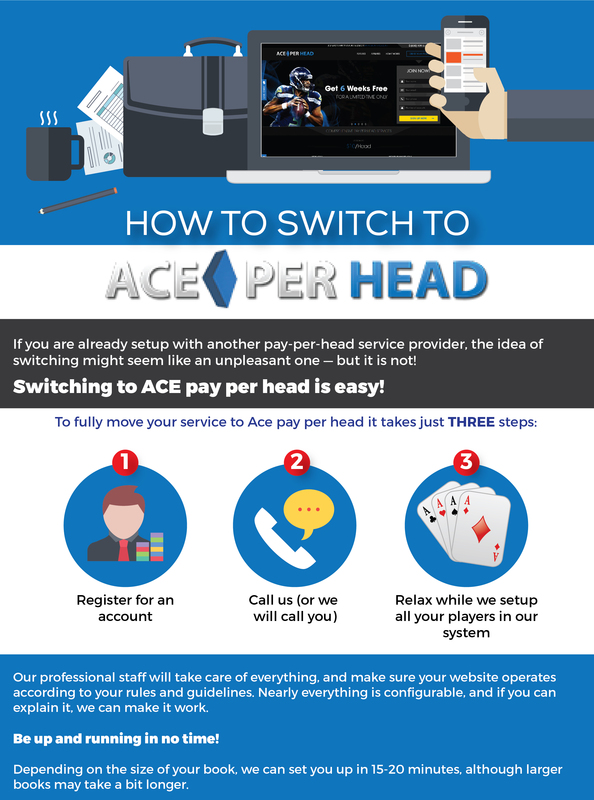 Now that you know how to switch to AcePerHead, what are you waiting for? There has been no better time to switch to the best pay per head service than now!